I make a lot of taquitos, but I've never made flautas. As far I can tell, taquitos use corn tortillas and flautas use flour tortillas. These are by no means authentic flautas. 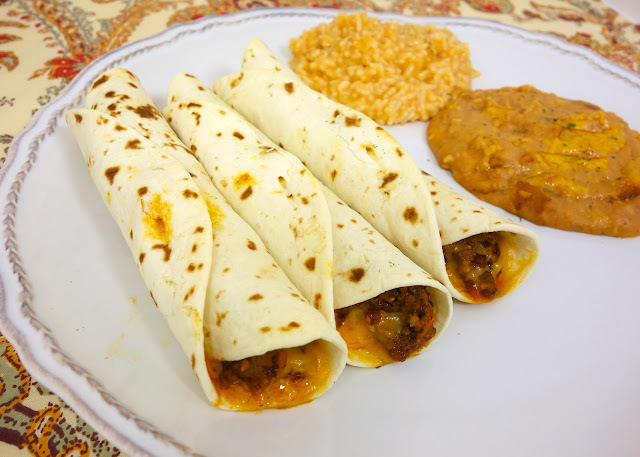 Authentic taquitos and flautas are fried. I baked mine because I don't like to fry food at home. It is so messy, and I never know what to do with the used oil. I had some leftover flour tortillas from the Italian Fajitas we made and decided to make these flautas. I thought they were a great change to our regular soft tacos. I used a simple beef and cheese filling. Make sure to roll the flautas very tight. I secured mine with toothpicks so they didn't open up while they baked. You might want to make an extra batch of these and freeze them for a quick meal or snack. In a large skillet, cook ground beef until no longer pink. Drain fat. Return meat to skillet and add taco seasoning, salsa and water. Simmer for 5 minutes. To assemble the flautas, put 1/12 of the meat on top of the tortilla. Top with cheese. Roll up tightly and secure with a toothpick. Place on rimmed baking sheet. Lightly spray the flautas with cooking spray (to help them crisp up). Bake for 10-15 minutes, until warm and cheese is bubbly. 1/12 of the meat mixture??? Approximately how much?? Nini - just divide the meat between the 12 tortillas. About 2-3 Tbsp on each. You just have to eyeball it. These look SO good Steph!! And those beans? Uh, recipe please!! Kelley - the beans are easy. Can of refried beans, 1/2 cup sour cream, 1/2 cup salsa. Mix together put in small baking dish - top with cheese and bake with the flautas - should be heated through when the flautas are done. Oh yum, this looks delicious! Made these for dinner tonight & they were a HUGE hit with the hubby & the girls!!! And, I think they are going on the list of dinners the girls (8&9) can make! 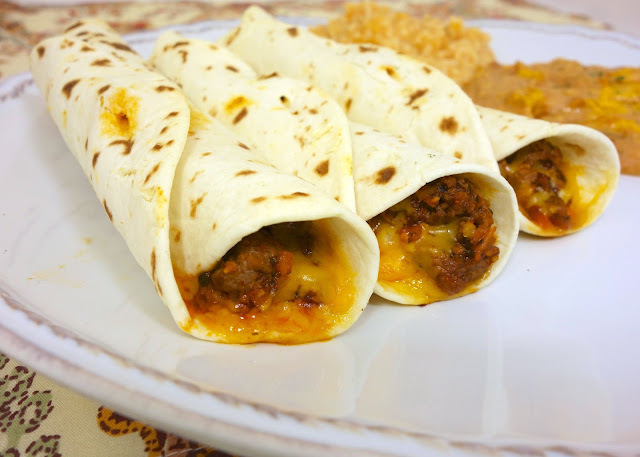 Wow these were so good, I made them with the Ro-Tel Mexican rice which was really good too.... I love all of our recipes I have tried.... I enjoy everyday lookin at your recipes posted and the Meow Monday too your cats are so beautiful :-) Thanks for sharing your wonderful recipes and beautiful pics. These look super good, Steph. I prefer mine fried, but like you, hate frying at home. Just passed through your neck of the woods this week. Man you guys had some weather, didn't you? Couldn't believe all the down trees from Ft Payne to Birmingham. These were delicious and couldn't get any easier. I made the beans to go along with them and some guacamole. Awesome dinner! Thank you for sharing your wonderful recipes!